Hannay Reels designs hose and cable reels that are durable, dependable, and outperform every other brand. We custom manufacture reels for booster hose, flat hose and large diameter hose – whatever your need – we can build a reel to your vehicle specifications. 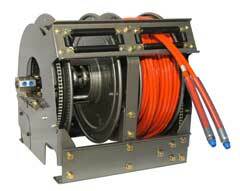 Hannay Reels also has a complete line of Rescue reels for hydraulic, pneumatic and electric rescue tools built to your exact needs to fit any compartment large or small. Our reels help cut attack time and increase safety, which makes a big difference in an industry where the lives of your crew – and community – are on the line. Quality. Value. Service. Built by Hannay. Hannay TEF Series Reels are designed to fit two reels in the same space as one traditional style reel. Reels are constructed of heavy gauge steel, chain and sprocket drive powered by 2 electric gear motors and optional four way rollers with adjustable positions. The dual spools allow for 2 independently operating reels with a choice of hydraulic, electric, utility air or breathing air options on either side – making it the most versatile reel on the market today for your rescue tool needs. Visit our website: www.hannay.com and download our Rescue Reels catalog for more information on these reels and our full line of Rescue Reels.